Background: Household and ambient air pollution are jointly responsible for about 7 million premature deaths annually. Women living in slums, with unhealthy environment, both indoors and outdoors, particularly those living close to industrial and/or vehicular pollution zones due to multiple sources of air pollution, are at the higher risk of having impaired lung function tests. Objective: The aim of this study was to estimate the prevalence of abnormal lung functions and to identify the environmental risk factors associated with them among adult women of 18–59 years. Materials and Methods: A total of 550 women aged 18–59 years were approached in a representative urban slum. Five hundred consented to participate and 299 had prebronchodilator spirometry satisfying ATS standards. House visits to assess environmental conditions were conducted to determine their association with forced expiratory volume in 1 s (FEV1) and forced vital capacity (FVC). 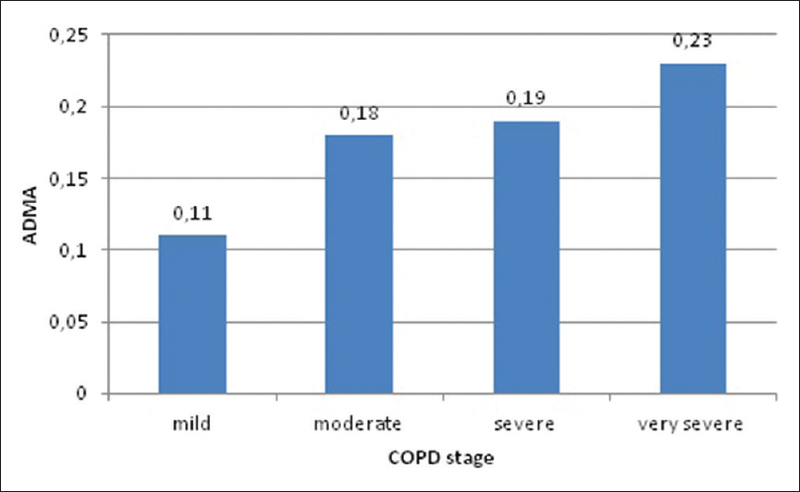 Chi-square test was used to test the association of risk factors with lung functions. ANOVA was used to test the association of mean values of FEV1 and FVC with age. Results: Out of 299 participants with acceptable spirometric curves, 5% had reduced FEV1/FVC ratio than the normal and 26.8% and 17.4% had lower values than predicted for FVC and FEV1, respectively. Altered lung function was related to age, tobacco smoking, and history of respiratory disease. 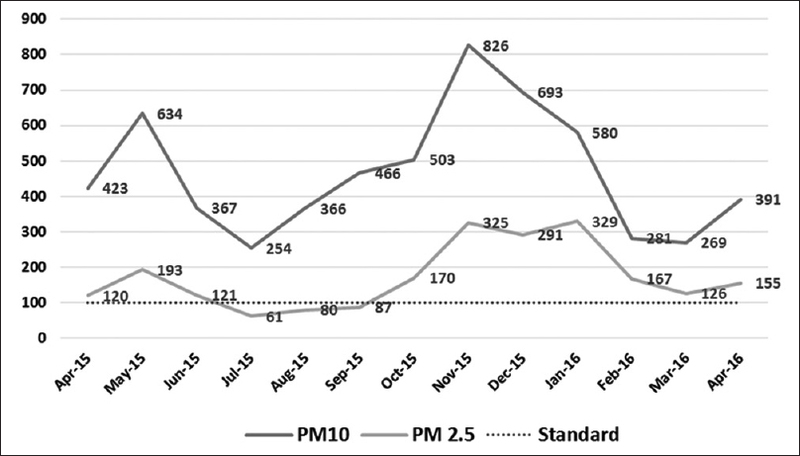 Conclusions: Both ambient and household air pollution have a deleterious pulmonary effect on long-term women residents of a representative urban slum in Delhi. Background: Asymmetric dimethylarginine (ADMA) has emerged as a risk marker for many conditions related to pulmonary hypertension (PH); however, little is known about ADMA and symmetric dimethylarginine (SDMA) plasma concentrations in chronic obstructive pulmonary disease (COPD). Our interest centers on the role of ADMA in regulation of endothelial function in COPD and secondary PH. The aim of the present study was to evaluate the serum ADMA, SDMA, and L-arginine concentrations in COPD and its association with PH. Methods: Patients with diagnosis of COPD underwent pulmonary function tests, echocardiography, and laboratory investigations including ADMA, SDMA, and L-arginine. Results: Serum concentrations of ADMA, SDMA, and L-arginine tend to increase as COPD progresses. Patients with PH had higher concentrations of ADMA, SDMA, and L-arginine compared to cases with normal pulmonary arterial pressure (PAP); the difference was not statistically significant. Conclusions: Our results show that increased ADMA, SDMA, and L-arginine concentrations are associated with increased PAP measurements in patients with COPD, however, the relationship is not statistically significant. Background: There are very few studies about the mechanism of fibrosis in tuberculosis (TB). This study aimed to determine the levels of tumor necrosis factor-α (TNF-α), insulin-like growth factor-1 (IGF-1), and transforming growth factor-β1 (TGF-β1) in pulmonary TB patients with minimal and extensive lesions. Materials and Methods: Cross-sectional observational study design was used to observe the pulmonary TB patients with minimal and extensive lesions, and also healthy controls, each consisting of ten patients. Results: The plasma levels of TNF-α, IGF-1, and TGF-β1 in pulmonary TB groups were higher compared to the healthy controls. The TNF-α level in the minimal lesion of TB group was higher than the level in the extensive lesion but not significant (P = 0.741). The IGF-1 level in the minimal lesion of TB group was significantly (P = 0.007) increased compared to the extensive lesion. While the TGF-β1 level in the minimal lesion of TB group was significantly (P = 0.005) lower than the level in the extensive lesion. Conclusion: In extensive lesion of TB group, there are differences in the levels of TNF-α, IGF-1, and TGF-β1 compared to the minimal lesion of TB group as well as the healthy controls. 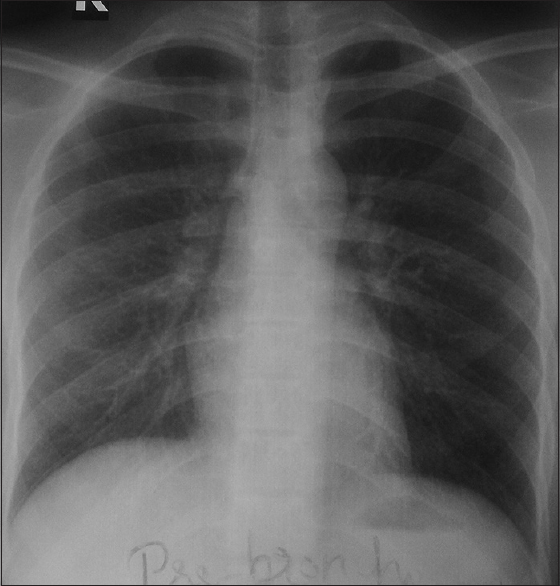 The extent of lesions on chest radiograph also describes the state of ongoing pulmonary fibrosis which can be shown by the differences in the levels of pro-fibrotic cytokines. 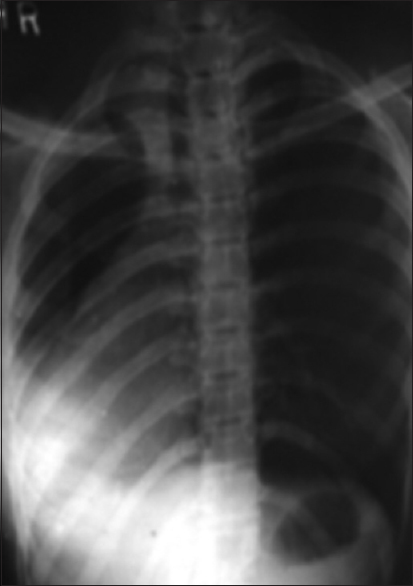 Aim and Objective: This study aims to report 100 pediatric patients of empyema thoracis treated by open decortication, highlighting the presentation, delay in referral, operative findings, the response to surgical intervention, and follow-up. 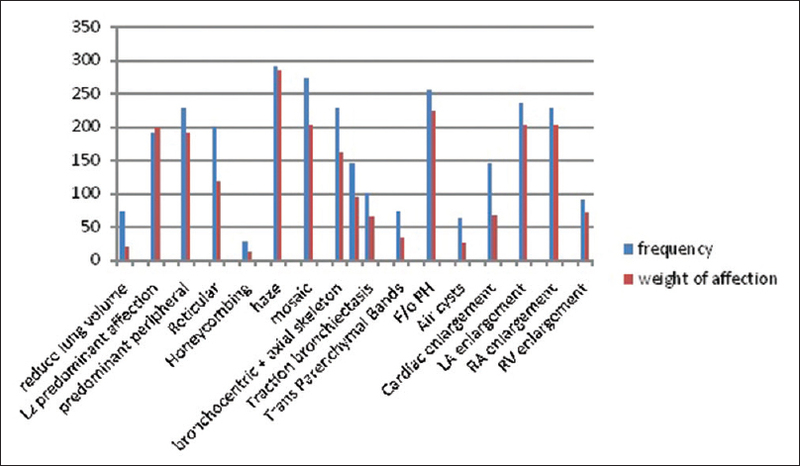 Materials and Methods: All the children who underwent open decortication for stage III empyema thoracis during the study period January 2015–December 2016 were included. Preoperative workup included hemogram, serum protein, chest radiographs, and contrast-enhanced computed tomographic (CECT) scan of the chest. Results: One hundred (65 males, 35 females) (age 2 months–13 years, mean 4.5 years) were operated during a 2-year period. Among them, 90% patients were referred 3 weeks after the onset of disease. 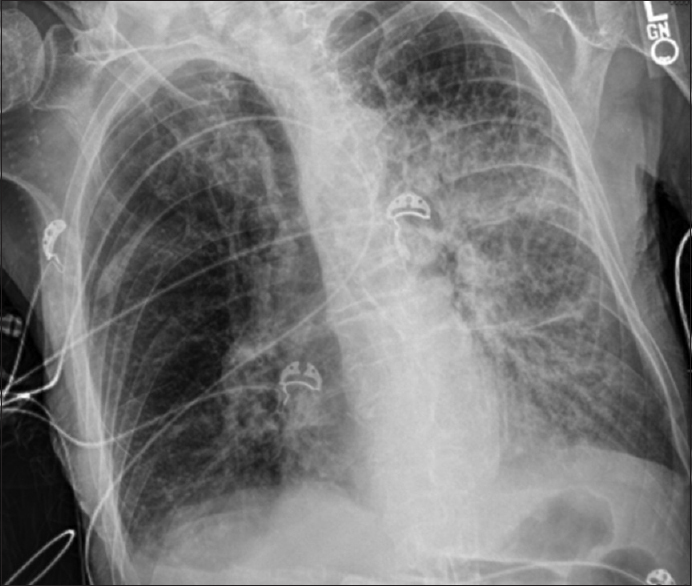 Intercostal chest drainage (ICD) had been inserted in (95) 95% cases. 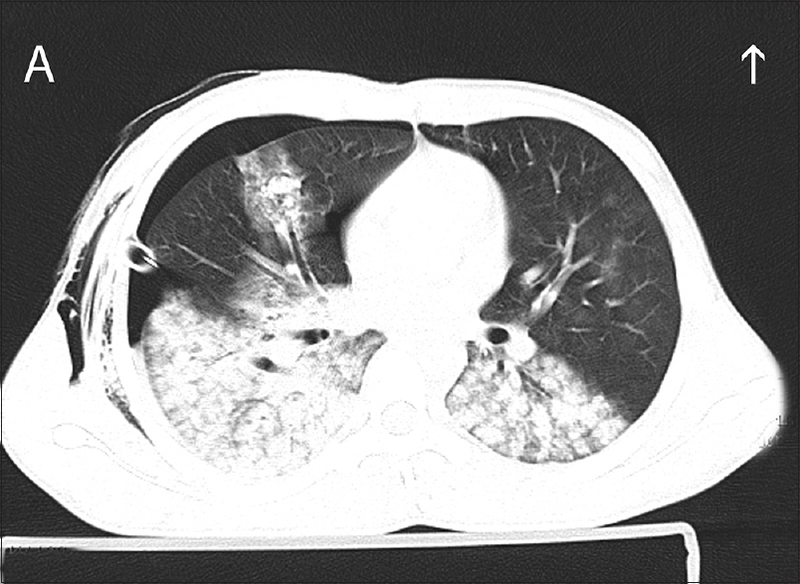 Thickened pleura, multiloculated pus, and lung involvement were invariably seen on CECT scan. Bronchopleural fistula was present in five patients. Decortication and removal of necrotic tissue were performed in all the patients. Mean duration of postoperative ICD was 4 days. Follow-up ranged from 1 month to 2 years (mean 12 months). There was no mortality. Five patients had proven tuberculosis. Only 10% presented within the early period of the disease. Conclusion: The duration of the disease had a direct relationship with the thickness of the pleura and injury to the underlying lung. Delayed referral causes irreversible changes in the lung prolonging recovery. Meticulous open surgical debridement gives gratifying results. The status of the lung at the end of surgery is a major prognostic factor. Background: Chronic hypersensitivity pneumonitis (HP) is the most common cause of diffuse parenchymal lung disease (DPLD) in India. There is no data regarding the avian antigen exposure-associated DPLD from the country. Methods: Chronic HP from exposure to avian antigen was diagnosed when the high resolution computerized tomography (HRCT) showed features for HP and was supported by the history of exposure to pigeons, the presence of precipitin antibodies (IgG) to avian antigen in high titre with negative rheumatoid factor, antinuclear antibody, and no clinical clue for a collagen vascular disease. The HRCT changes were noted on Likert scale (0–5) in terms of affection of peripheral and/or axial involvement, reticulation, honeycombing, haze, mosaic, traction bronchiectasis, pleural reactions, features of pulmonary hypertension, and air cysts. Cardiomegaly and independent cardiac chamber enlargement were also recorded. Results: The lower lobes were predominantly (65.6%) affected with similar frequency (78.1) of peripheral and axial parenchymal affection. The parenchymal changes in HRCT were haze or ground-glass opacity (100%), mosaic appearance (93.75%), reticulations (68.75%), traction bronchiectasis (34.3%), air cysts (21.8%), and honeycombing (9.37%). Pleural reactions, though not described so far, were found in 50% of cases. Features of pulmonary hypertension (87.5%), cardiomegaly (50%), left and right atrial enlargement (81.2% and 78.1%), and right ventricular enlargement (31.2%) were the common echocardiography findings. Conclusion: Chronic HP from avian exposure shows predominantly lower lobe involvement with haze, reticulation, features of pulmonary hypertension, and pleural reactions as common HRCT findings. The likelihood of pulmonary hypertension appears high and although honeycombing is often present, the classical UIP pattern has not been found. Pulmonary lymphoproliferative neoplasms are rare lung tumors and account for <1% of all lung tumors. Among them, primary pulmonary lymphomas (PPL) constitute the majority, which include Non-Hodgkin's lymphoma (NHL) that comprise of mucosa-associated lymphoid tissue lymphoma, diffuse large B-cell lymphomas and other rare types of NHL and lymphomatoid granulomatosis. HL, which arises secondary to contiguous spread from the mediastinum, is the rarest type of PPL. Other entities described within the umbrella of pulmonary lymphoproliferative neoplasms include pleural lymphomas and posttransplant lymphoproliferative disorders (PTLD) – which occurs in the poststem cell and organ transplant patients. These neoplasms although rare, have a favorable prognosis, which does not depend on disease resectability. Moreover, with its nonspecific presentation, diagnosis is challenging, which often leads to delayed diagnosis or misdiagnosis in many cases. Therefore, knowledge of this entity is important for the practicing pulmonologist. This review article aims to describe the clinical presentation, diagnosis and management of primarily the entities within PPL, as well as pleural lymphomas and PTLD. 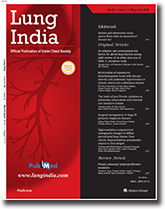 Diffuse parenchymal lung diseases (DPLDs) encompass a variety of restrictive and obstructive lung pathologies. In this article, the authors discuss a series of rare pulmonary entities and their high-resolution computed tomography imaging appearances, which can mimic more commonly encountered patterns of DPLDs. 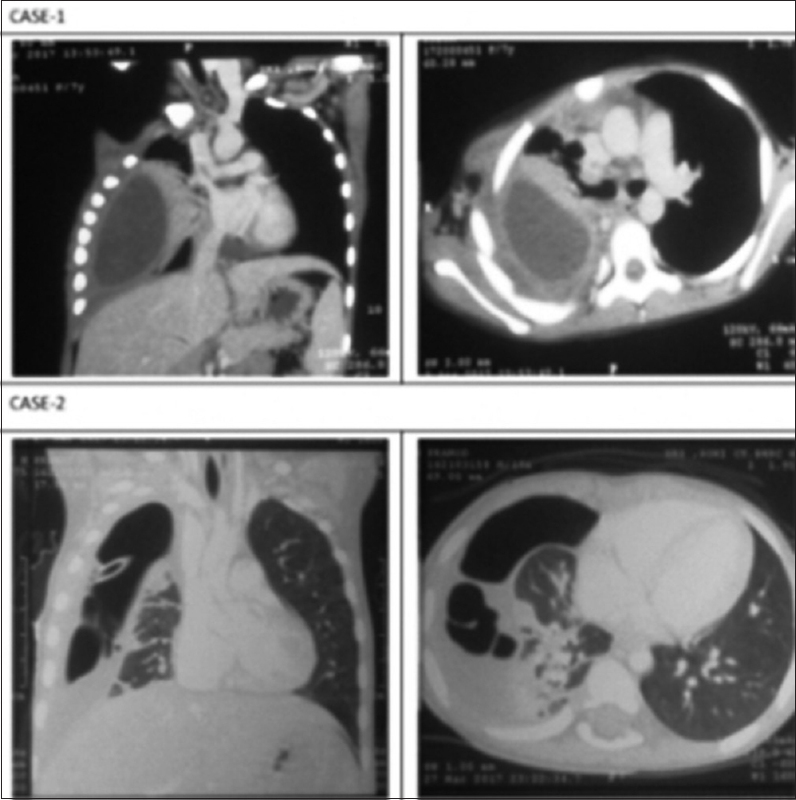 These cases highlight the importance of surgical lung biopsies in patients with imaging findings that do not show typical imaging features of usual interstitial pneumonia. Pasteurella multocida infection is most commonly associated with the immunocompromised, mostly in the form of soft-tissue infection, although other sites of infection are still possible and have been reported in the immunocompetent. 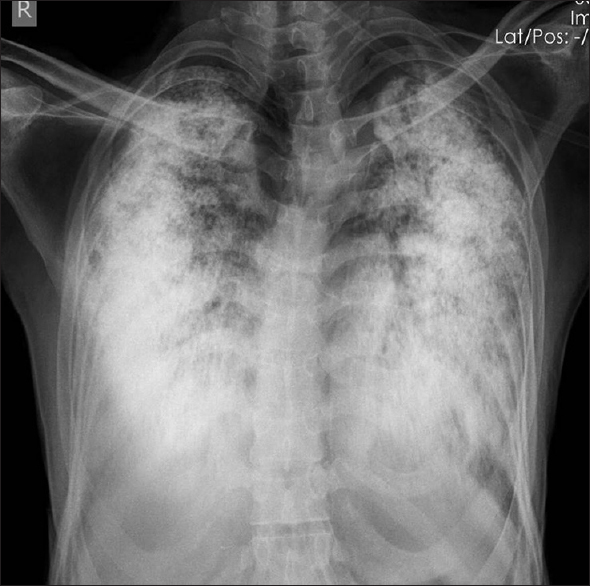 We report a case of an immunocompetent male with a history of exposure to carrier organisms without portal of entry who developed P. multocida pneumonia with bacteremia. We undertook a focused review of literature of previously reported cases of P. multocida pneumonia in patients with chronic obstructive pulmonary disease. This literature review supports the use of penicillins as the first line of treatment over macrolides. Considering the high mortality rates with P. multocida bacteremia, it is important for clinicians to maintain a high level of suspicion for this organism in any patient with a history of carrier species exposure. 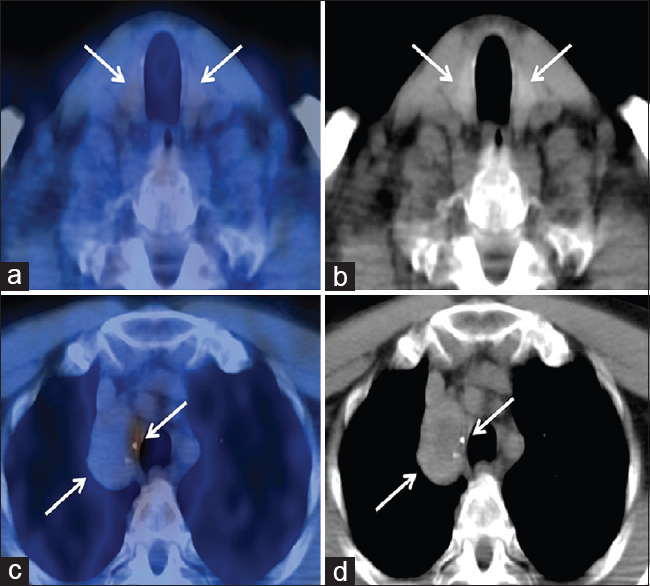 In the modern era, real-time imaging-guided transbronchial needle aspiration (TBNA) has completely replaced the traditional surgical approaches to sample the mediastinal lesions for diagnosis and cancer staging. However, there is a limited role of these innovations in the presence of critical airway narrowing due to a further decrease in cross-sectional area of the airway proportionate to the outer diameters of the scope. 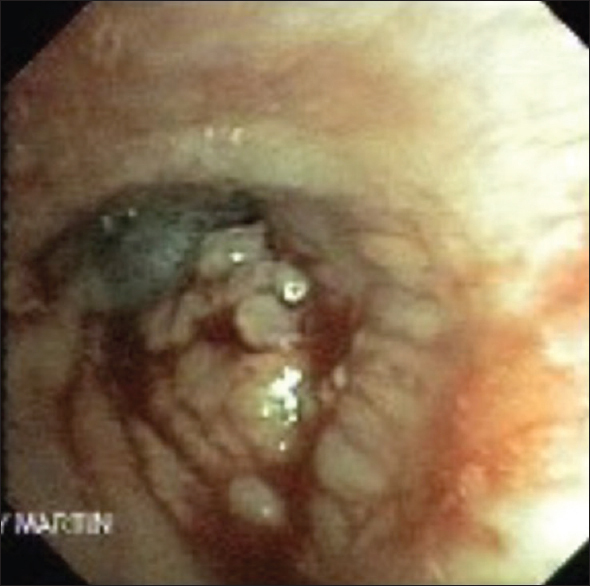 Rigid TBNA with airway control by rigid bronchoscopy is one alternative which can be used for mediastinal sampling when modern technique is impracticable. 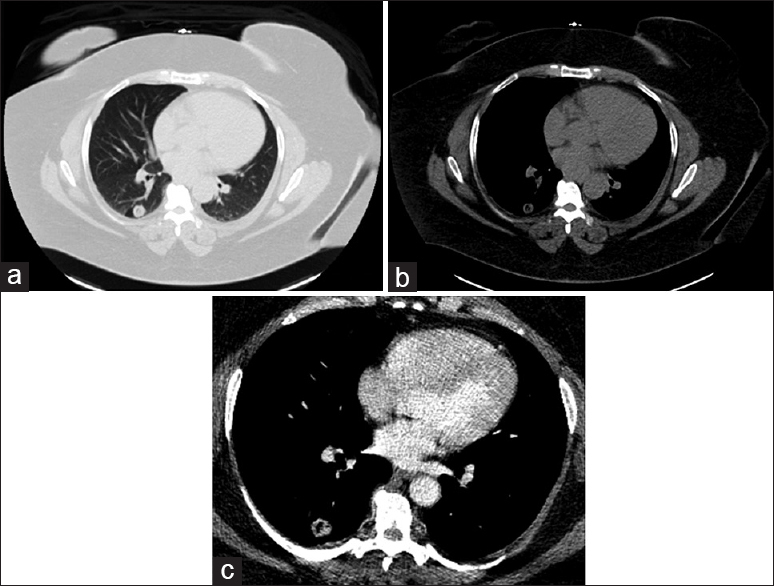 Herein, we report the use of rigid TBNA, an underutilized old method to sample the mediastinal lesion in a patient with severe orthopnea secondary to tracheal compression by mediastinal mass. Solitary fibrous tumor (SFT) is a rare mesenchymal tumor and several paraneoplastic syndromes have been related to it. We report the case of a 60-year-old male initially admitted to rule out cerebral vascular accident with the final diagnosis of SFT associated with paraneoplastic cerebellar degeneration and hypoglycemia. 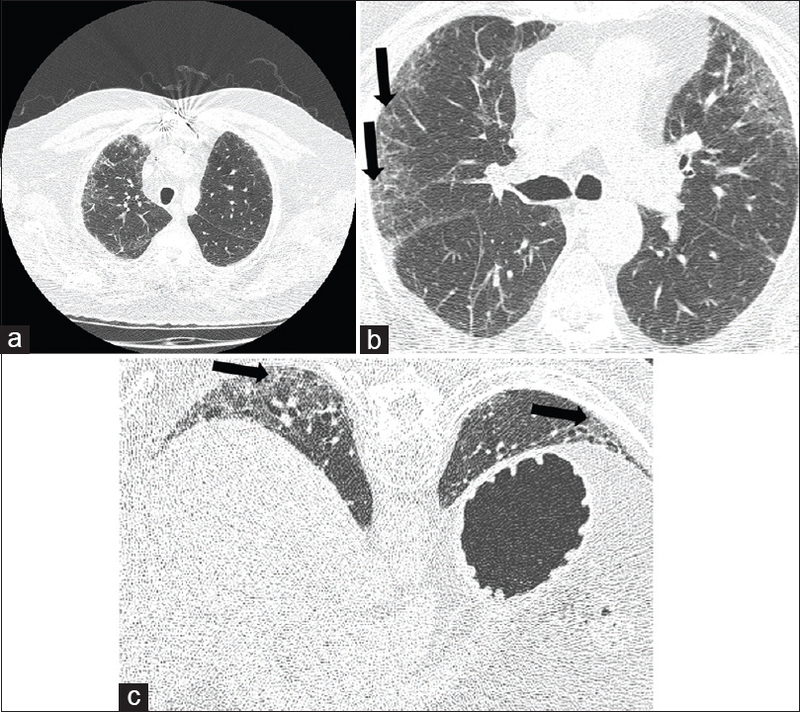 The diagnosis was confirmed by computed tomography-guided lung biopsy. Ectopic thyroid tissue is very rare, but its prevalence increases in those with thyroid pathology. It typically occurs due to aberrant development of the thyroid gland during its migration to the pretracheal region. In this report, there are two cases of mediastinal ectopic thyroid tissue discussed, which were initially considered to be malignancies. The hospital course, diagnostic workup, including the use of computed tomography and positron emission tomography scans, and the characteristic features of the tissue are examined here. Due to the imaging characteristics, it is important to consider ectopic thyroid tissue as a differential diagnosis for mediastinal masses as encountered in these cases. Asymptomatic ectopic thyroid tissue is usually treated medically; however, patients in both of our cases opted for surgical resection of the masses even after confirmation of the origin of the tissues. A 43-year-old female with a medical history of renal stones, hypertension, diabetes mellitus Type 2, and depression presented to her urologist with bilateral flank pain. She complained of worsening exertional dyspnea over the last several months with recent weight gain. She also endorsed night sweats and intermittent, scant hemoptysis over the past year. She denied fever, chills, nausea, vomiting, diarrhea, constipation, hematuria, or excessive joint or muscle pain. Physical examination was unremarkable. Computed tomography scan of abdomen and pelvis demonstrated bilateral nonobstructing renal stones and a 1.8 cm × 1.7 cm nodular opacity in the right lower lobe of the lung, not present on previous scan 1 year prior. 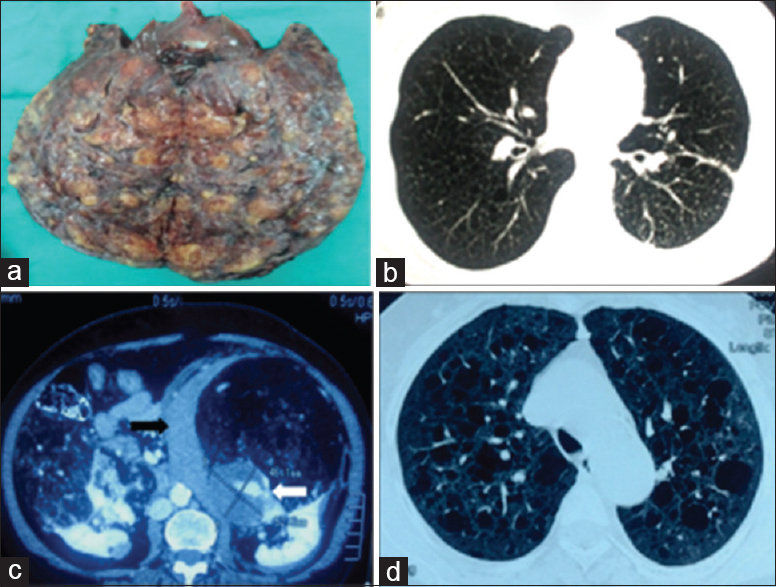 Surgical wedge resection was performed and subsequent pathologic examination demonstrated a 1.2 cm × 0.6 cm × 0.5 cm soft, gelatinous well-demarcated mass in the right lower lobe wedge specimen without gross evidence of necrosis or hemorrhage confirming colloid adenocarcinoma of the lung. Cryptococcosis is a menacing opportunistic infection most commonly affecting immunocompromised individuals. Its occurrence in immunocompetant individuals is uncustomary. Disseminated cryptococcosis is subtile in immunocompetent individuals. Cryptococcosis presenting with myriad of symptoms with involvement of lung, meninges, hematological system is rare. We present to you a unique case of disseminated cryptococcosis presenting as bilateral pulmonary nodular opacities with peripheral eosinophilia and meningitis along with a narration of the enthralling diagnostic process. 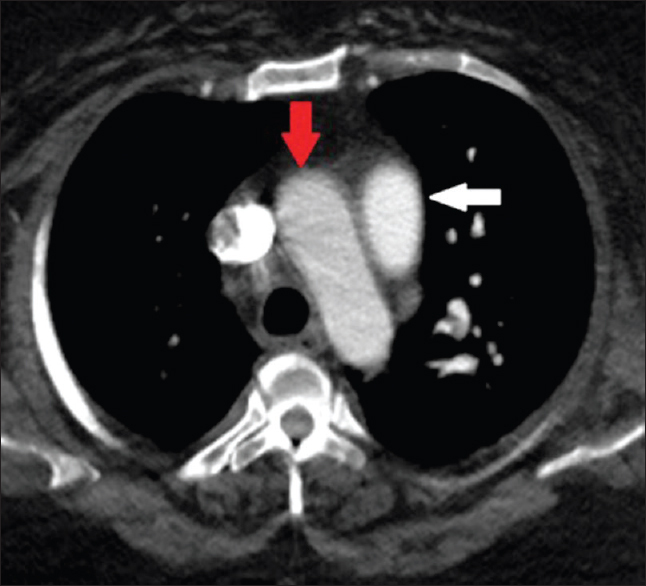 The egg and banana sign can be seen on chest computed tomography (CT) in patients with severe pulmonary arterial hypertension (PAH). It is identified by the presence of the pulmonary artery (PA) lateral to the aortic arch with the aortic arch being described as the banana and the PA as the egg. Lung contusion usually follows blunt trauma to the chest. If not properly diagnosed and adequately treated, it could at times be fatal as well. This case is being presented to highlight the radiological findings of this condition.